The Vornado duo tower circulator is a product of the Vornado tower fan range which is built for average sized households and bedroom use. The primary distinction between the Vornado tower fan in comparison with ordinary pedestal and ceiling fans is its ergonomic design and engineering V-Flow technology which helps drastically improve air circulation across the entire room. Its powerful motor is capable of producing air movement of up to 50 feet for higher range models of the series. reference between similar products of its nature. Conventional fans used in households and industries alike are designed to provide a constant air flow in a given direction to which the appliance is being faced to. This often leads to issues wherein air flow towards a considerably larger room would be heavily restricted towards a given direction only. However Vornado duo tower circulator aims to solve this issue with its V-Flow circulation which gives it the ability to circulate air across the entire room more efficiently and effortlessly when compared to the conventional fans in the market. It also comes included with a one button design which has been made specifically to allow the user to select the 4 fan speed settings of the circulator rather easily. This feature is not specific to this base model, but is available on other models as well. Another distinct advantage of Vornado tower circulator in comparison to its conventional counterparts is that it offers an ultra quiet operation and comes backed up with a 5 year limited warranty. The product is designed specifically to suit the US Voltage requirements and has also been safety tested and certified to be used only within the US. However on the flip side, there are a couple of considerations which should be noted when choosing the Vornado tower circulator as it does not come with a remote controller and is not wall mountable. Also, it tends to be a bit noisy when operating at higher speeds. Nevertheless, this isn’t a major issue as the benefits which it provides outweigh the drawbacks of the device, especially its ergonomic design which helps it provide an even and constant air flow at all times. The key reason for the Vornado tower fan to provide a much wider air flow on a constant basis is due to the fact that the conventional tower fans tend to oscillate whilst distributing air to a narrow range, which often makes the surrounding environment to receive air flow only seconds at a time. The Vornado tower fan on the other hand actually circulates air to a wider range constantly to provide optimum comfort for all occupants and appliances, if applicable, at all times. The reason the Vornado tower fan has this competitive advantage over its conventional counterparts is because it has not been fitted with an oscillator, rather it uses a circulator which gives it the ability to curve the air which would be otherwise expelled to a wide angle across the entire room simultaneously rather than hitting each occupant for a fraction of a second. Its sleek and trendy design also gives it a more modern look and doesn’t require as much space in the room as conventional fans do. Due to this V-Flow technology, Vornado Tower Circulator does not require an oscillator and is thus also able to operate at a much quieter pace as conventional fans. However as the device does not oscillate, it’s important that it’s placed at the correct section of the room in order to get the maximum air flow throughout the entire area. 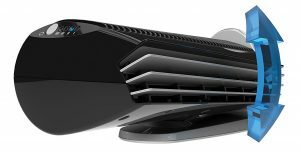 Yet another unique feature of the Vornado tower fan is that even in comparison with other tower fans in the market, the V-Flow technology gives it the ability to even circulate air behind the device as well, which isn’t something prevalent in conventional pedestal or tower fans of the past. The state of the art technology used in the Vornado tower fan are backed up with a 5 year warranty which gives total satisfaction and peace of mind to the potential customer as all repairs and replacement would be made for the product during the warranty period, provided the product is being used within the US market. Nevertheless, it should also be noted that due to its unique air flow technology, those who are close to the device may not necessarily be able to get its breeze as it aims to direct the flow of air across the very ends of the room. Although this base model does not come with a remote controller it does come with a 2 pin polarized power cord which is 6 feet in length. It consumes only 32 watts of electricity at 60 Hz which is considerably less than a conventional pedestal or ceiling fan used in homes. The operating voltage of the device is 120V and it offers a RPM of up to 1450 at its highest speed settings. This makes this product an ideal choice to be used on a mid sized to large roomed house or other similar environment, mainly because of its technological advancement in being able to direct air flow to a distance of 50 feet or more for higher range models. In spite of the fact that some users complain of its noise levels when operating at higher speeds it should also be noted that the device does not wobble or require any furniture to be rearranged as it does not oscillate, therefore in comparison with other tower fans in the market and conventional pedestal and ceiling fans this makes a perfect compromise to provide a smooth flow of air for the entire room or living area at an ultra low and affordable price tag.